The Imperial Plaza hawks are beautiful, majestic and purpose serving. Sitting high in a tree that is by the parking lot of the building named “Boxwood”, I can sit on the bench, smoke my cigar and watch them (as well as take a picture or two). I have noticed that chicks have hatched and the female stays in the nest. Mothers, no matter what species of creature, with very few exceptions, take care of the young and the male hunts for both female and young. In return for the nesting, the Imperial Plaza garden don’t have much trouble with animals picking through the garden taking what is there. They also provide pleasure through their soaring, jumping from one tree to another and being a sentinel by sitting on the ends of buildings keeping watch over the property. They do not cause any problems and, as far as I am concerned, they are welcome to stay as long as they desire. 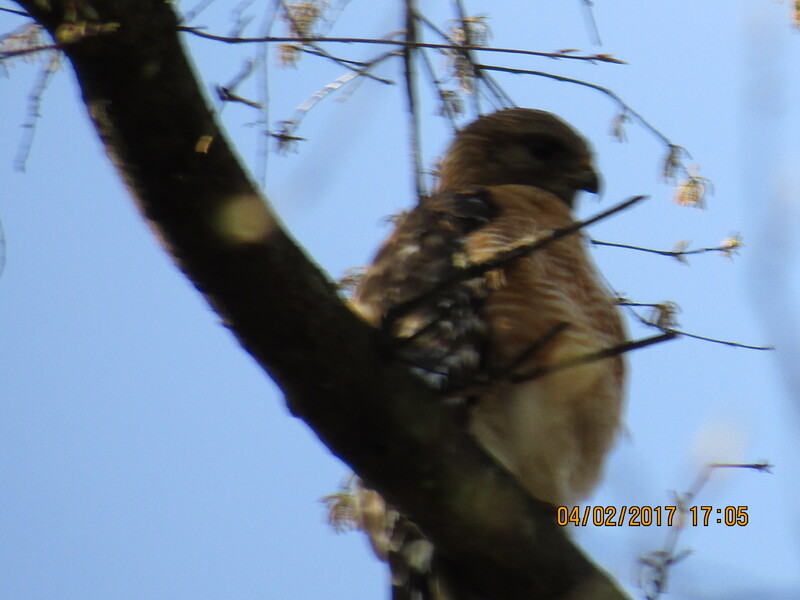 W. Germany and the symbol was a hawk. I was there ten years and we were known as the Hahn Hawks. We have a Facebook site that tells the story of the base and a Facebook private site so we may stay in touch and talk in private. The Imperial Plaza hawks are another matter. They are immigrants. I know that is a stretch but let’s look at this metaphorically. Lately the immigrants and the wall have been an issue but I can use the hawks as a metaphor for the immigrants. The male and female hawks flew over our fence and set up home in the top of our tree. They were not invited but they are here anyway. However, they tend our garden and keep other vermin at bay. They don’t cause problems and stay to themselves. They do a job that we can not and will not do. Therefore, we live in harmony with them. We are not afraid of them and they are not afraid of us. The wall and immigrant situation is just about the same. For years and years we have lived in harmony with many people that are not legal residents (most are legal). However, they tend and pick our produce, do construction work and many other things that Americans either don’t want to do or want much more money to do the job. Okay, get rid of the birds. Let’s say, people are afraid of them and want them gone. What is left is a mess. Not a thing will be left in the garden because the animals will get it all. Squirrels and rabbits will take over, not counting the other small animals I have seen. Imperial Plaza will not be the same. The same thing will happen with the immigrants. The fields will not get picked, tree edibles either, we will be short of construction workers as well as other low pay employee jobs like lawn care. Think about the pay. The immigrant will work for ten dollars an hour or less. The high brow American want more, much more. Ten dollars an hour for a ten to twelve hour day is not as much as fifteen dollars an hour or more. The American will only work five days a week or less and the immigrant will work six or seven days a week, if you let them. Then there is anything over eight hours of work become overtime but not for the immigrant, unless it is automatic, and anything over a five day work week (forty hours) is overtime unless you’re an immigrant. I watch the male bird bring food to the nest for the female and the chicks. It is a pretty sight. The bird keep a little, so as to have the strength to continue working, and the rest is for the nest. The immigrant is the same. They make the money, keep a little and send the rest home (where ever the locale), just like the birds. Most Americans will make the maximum amount of money they can, keep most of it for themselves and give the family as little as possible. There is another part to this saga. Send the male and female birds back across the fence because they are illegal. The chicks must stay because they were born here and have a birth right. Now Imperial Plaza must care for the chicks. They must provide food, lodging, medical care, clothes, etc. That will be a lot of money when the male and female birds were doing it and Imperial Plaza did not pay anything.